This is one of the most meaningful recipes in my recipe book, certainly one that brings with itself the sweetest memories. This is my father’s favourite dessert and my mother used to bake it for him every time he came back for his periodical home visits from working abroad. 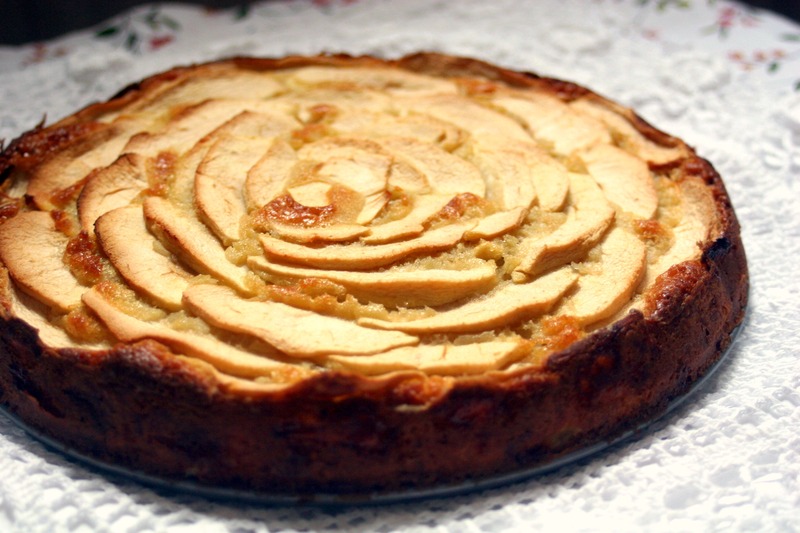 It reminds me of the feeling of expectation you have when you know you are going to see someone dear whom you haven’t seen for months, the fragrance of baking apples coming from the kitchen takes me back to how lovely it was to sit around the table, aged 5, on an afternoon with my dad smiling, having a slice of this cake, drinking his espresso and playing around with me. It reminds me of how lovingly my mum mixed all the ingredients together, confident that my dad would’ve appreciated it as a gesture of care and love. This is indeed my mum’s personal interpretation of a classic Italian recipe, and getting the doses out of her was somewhat of a mission: “I go by the eye” is her official motto! I always use plain flour + baking powder so I get through the flour quicker, but you can use self-raising flour, if you prefer. So here it is, I hope you enjoy making it as much as eating it. Wash, peel, core and dice the apples for the mixture in ½ in little pieces (leave the apple for the top for now, if you peel them too much in advance they’ll oxidise and be brown by the time you are ready to place them on the cake). Preheat the oven to 180°C/350F/Gas 4 and grease and coat an 18cm/7in cake tin. Cream the room-temperature butter and the sugar together in a bowl until all uniform and fluffy. Beat in the eggs, a little at a time, and add in the vanilla extract. The mixture should be quite runny. If it isn’t, add a glug of soya or cow’s milk. Add the raising powder, mix really well and finally add the chopped apples. 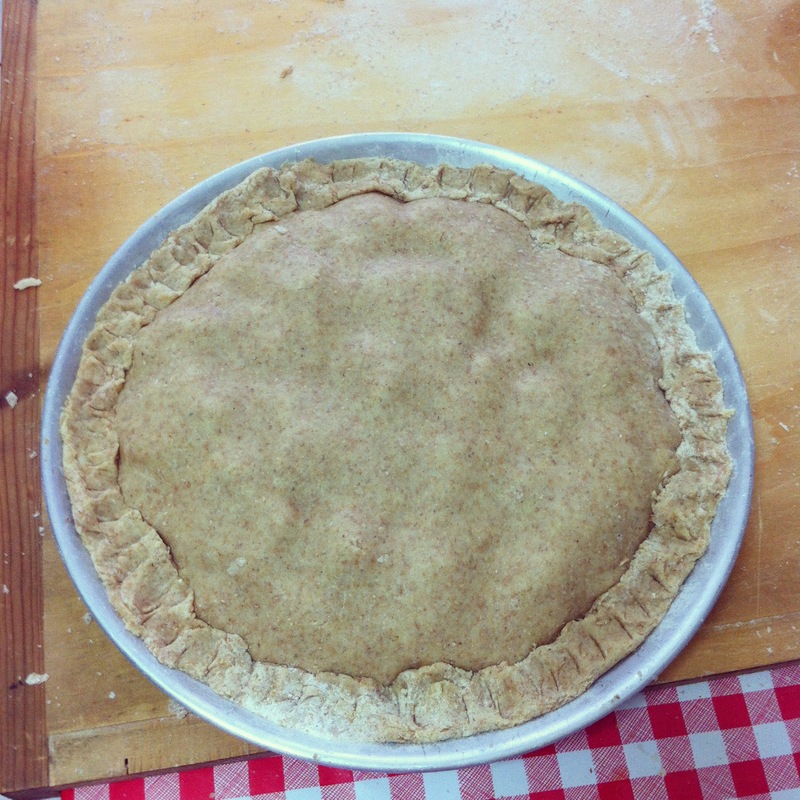 Now pour the batter into the tin. It’s time to prepare the rest of the apples. Wash, peel and core them. To cut them, cut the apples into vertical quarters and then slice them vertically to a thickness of about 1/3 of a cm being very careful not to break the slices. 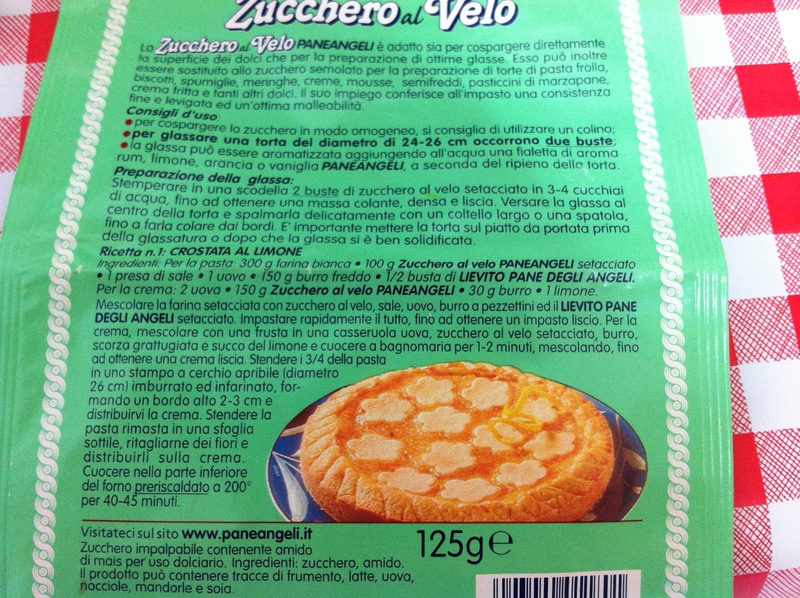 Place the slices on top of the batter as shown in the first picture above. Bake for about 35 minutes or until a skewer inserted into the middle comes out clean. 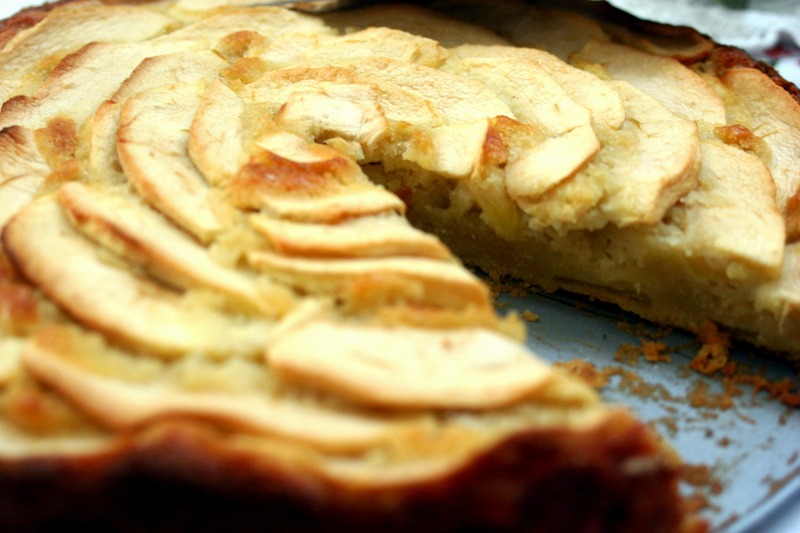 This cake is wonderfully moist because of all those lovely bits of apples inside that go really soft when baking so you can serve it on its own, or if you like to contrast the apple flavour, serve with cream, custard or vanilla ice cream. 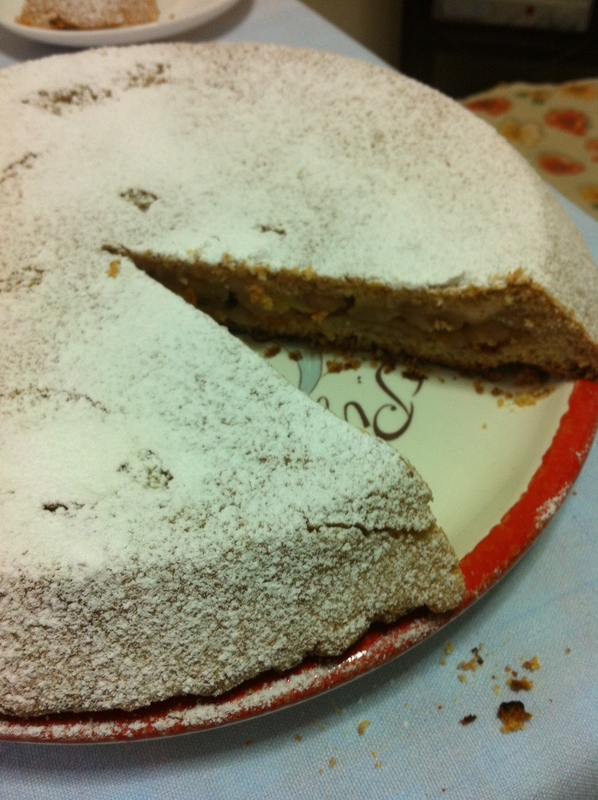 Finally, I thought long and hard whether to translate the word torta into pie, tart or cake. 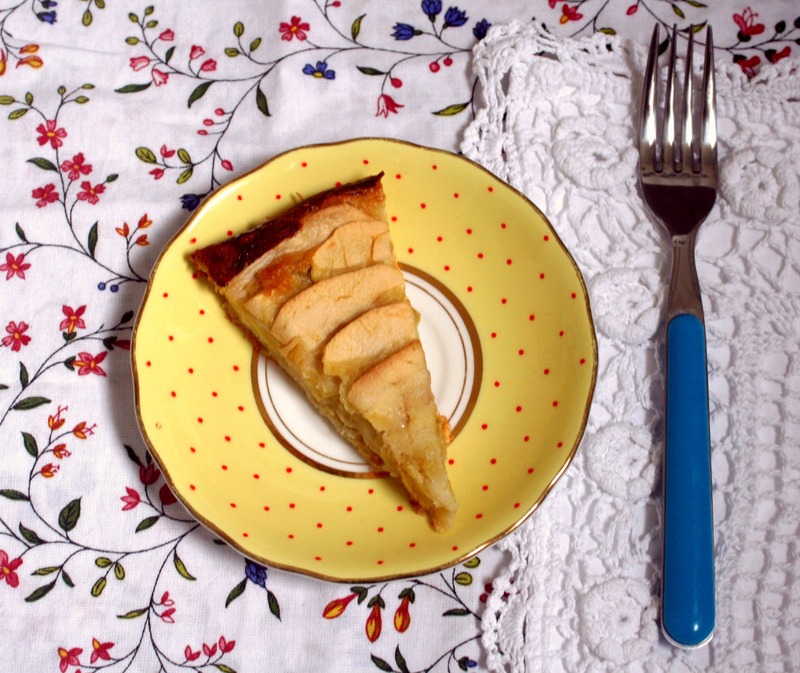 Pie is not right as there is no crust in this recipe, and tart just didn’t feel right, as that would be a separate base with a filling and a just a fruity topping. So I decided to settle for cake, as the preparation method for the basic mixture is not too different from a Victoria sponge. Let me know what you think! A couple of weekends ago, my friend Sara and I decided to make a healthy quiche which didn’t include tonnes of cheese as pies normally do. We decided to cut out the cheese completely and instead go heavy on the veggie goodness. Unfortunately by the time the quiche was cooked the sun had set and we had to take the picture of the final result with artificial light, but hopefully you should be able to get the idea of how delicious it looked (and tasted) nonetheless. 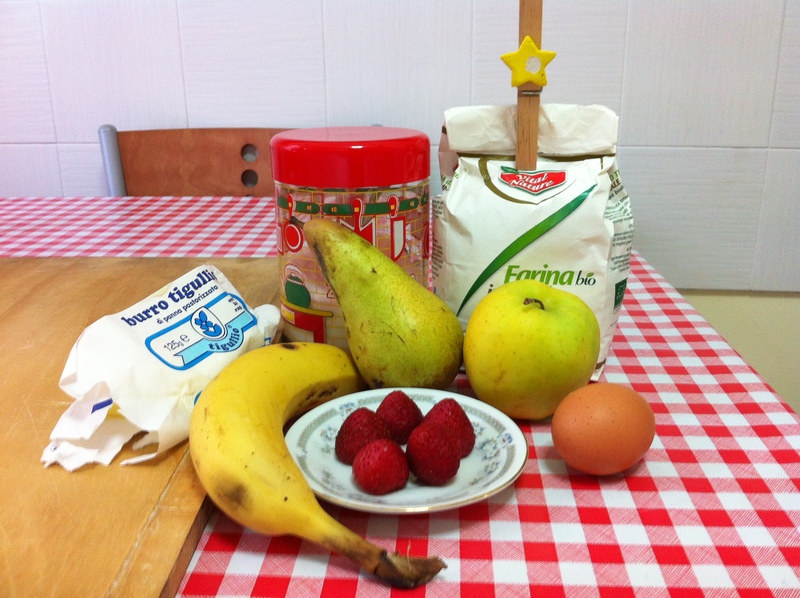 By the way, all the pictures in this post were taken by Sara, the master of food photos. 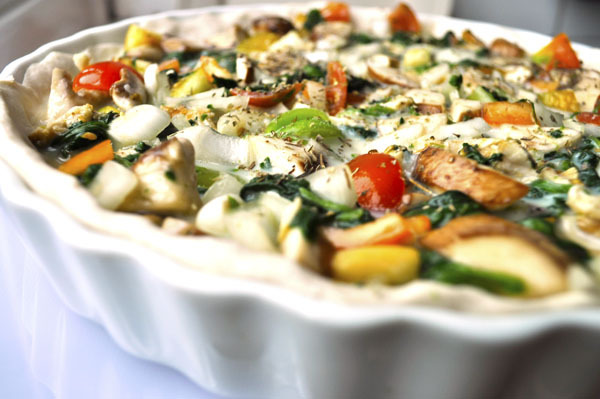 This quiche is brilliantly healthy and because it has no dairy, it could easily become vegan if you decide to omit the chicken and swap the eggs with flaxseeds. 100 gr of chicken is a very little amount for a whole quiche but I decided to add it in to add some protein, as I did not include any cheese, and because I had defrosted it and wanted to use it. So feel free to add the double amount of chicken, if you like. Preheat the oven to 200°C (400°F/Gas 6). Pour the olive oil into a tissue and rub it thoroughly on a quiche plate, making sure to cover well the bottom and sides of it. Place the spinach in a small pot with about a tbsp of water and let thaw on medium heat. Grill the chicken in a non-stick pan. 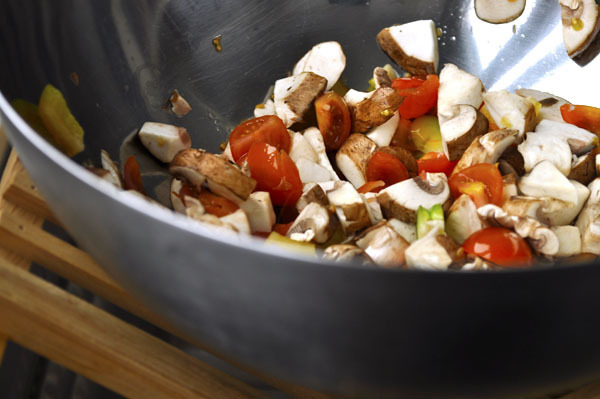 While the chicken cools chop the vegetables into about 1-inch (2.5-cm) cubes. Chop the chicken. 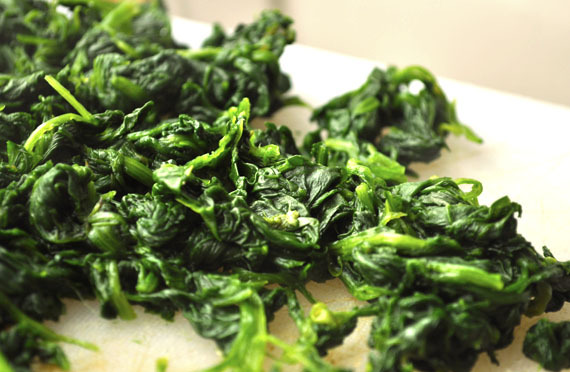 Once the spinach is fully defrosted, spread it on a chopping board and leave it to cool, as you don’t want the egg whites to scramble when you mix them with the spinach later. Place all the veggies and chicken in a big bowl and mix well. Add the egg whites from the two eggs (saving the yolks), oats, plenty of herbs, salt, a good dose of black pepper and a dash of Tobasco. If at this stage your mixture looks a bit too dry feel free to add the soya milk. If you are worried it might be too runny or wet add another spoonful of oats. Make sure you always stir well in order to get all the ingredients hobnobbing! Get your puff pastry and knead it altogether. 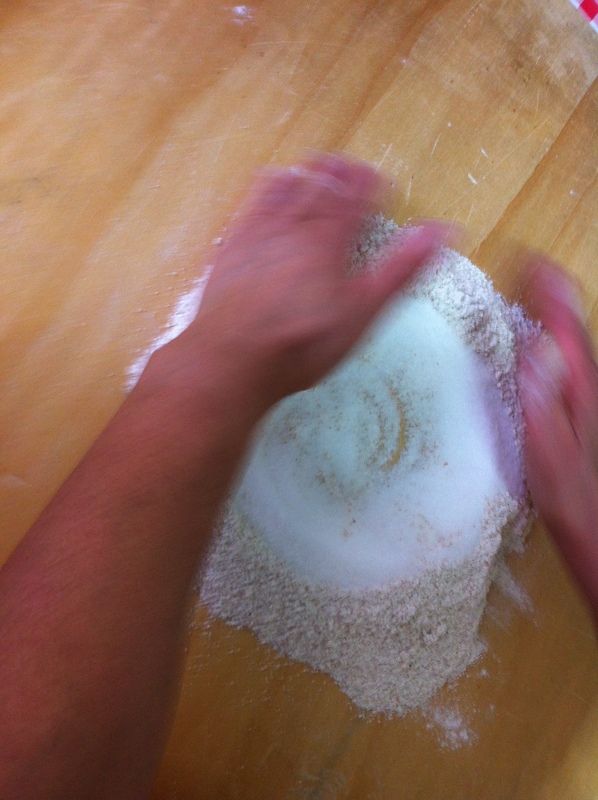 Make sure you’re working on a floured base as you don’t want your pastry to stick to your table/board. Roll it thinly, about 0.2 in (5 mm). 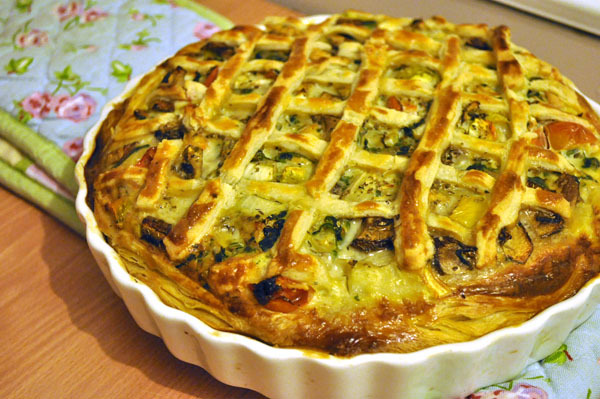 You should have enough pastry there to place a whole layer on the quiche dish and save some on a side to cut the lattice pattern. 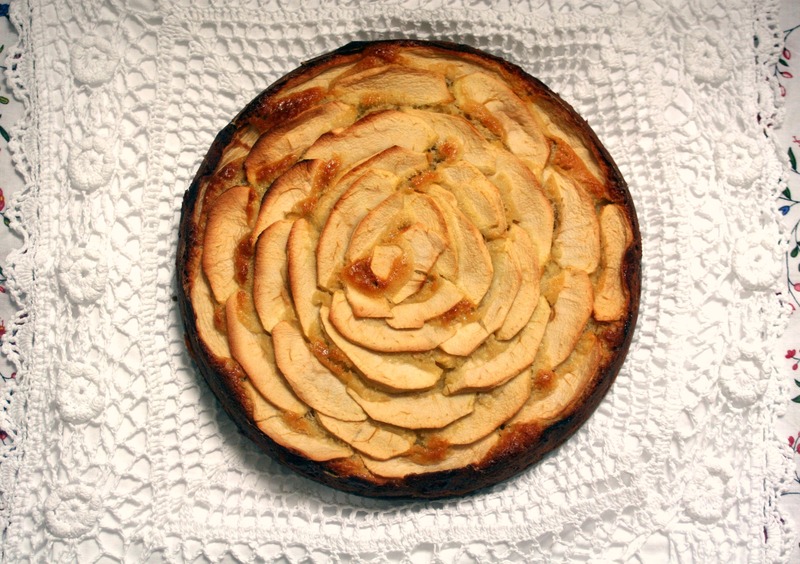 Once you have spread the pastry at the bottom of the dish, pour all the other ingredients into it and then start cutting the pastry for the top pattern. The strips should be about ½ in (1.2 cm) wide. Try to keep them from breaking but even if they do it’s not too big a problem as you can always join to pieces of strips together. 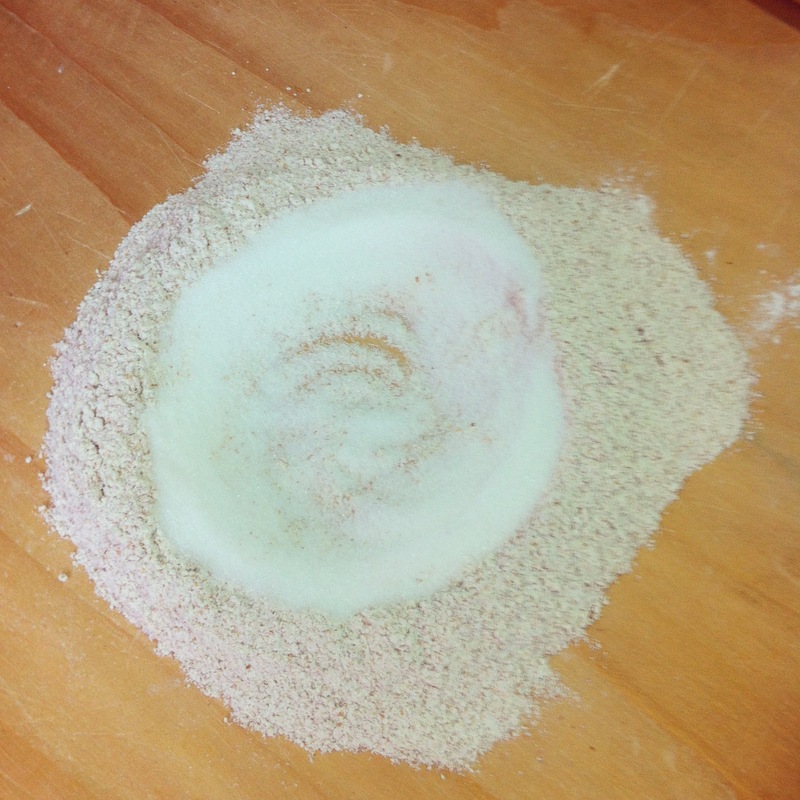 Beat the egg yolks together and spread the liquid on the pastry with a brush. 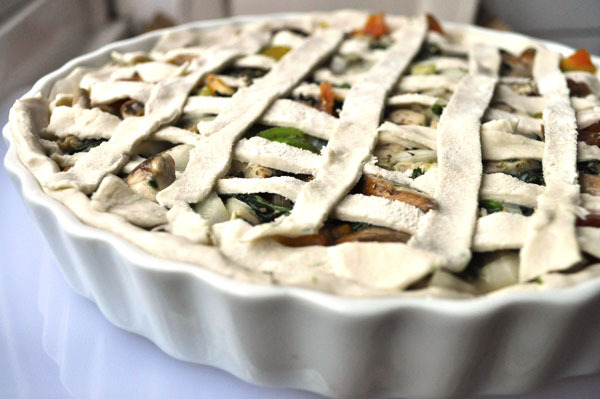 Place in the oven and leave to bake for a good 40 to 45 minutes as you want the vegetable juices to dry away and the pastry to rise beautifully. 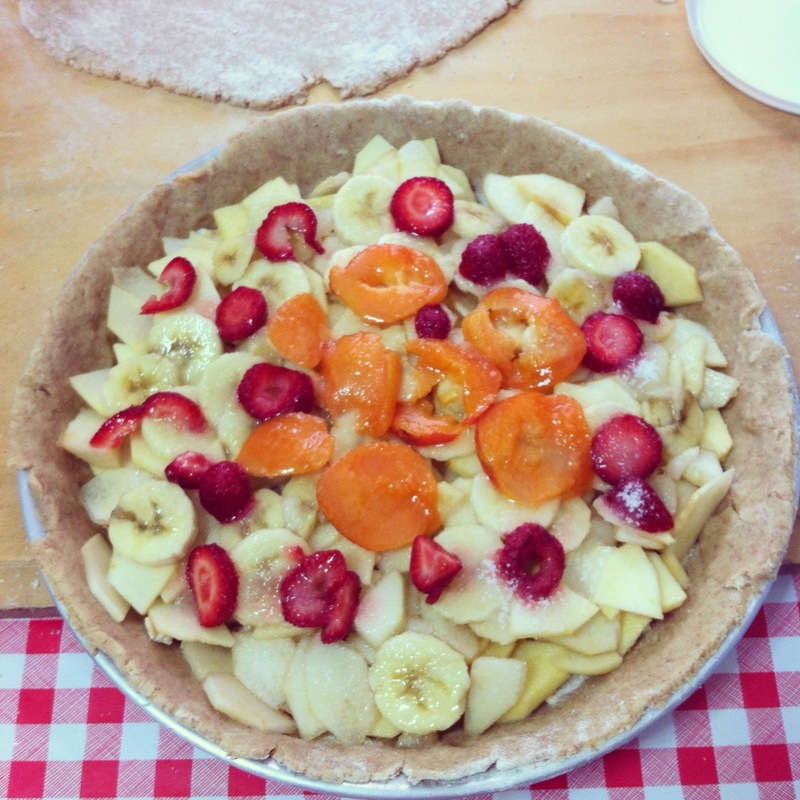 Let it cool a little before slicing and then enjoy!